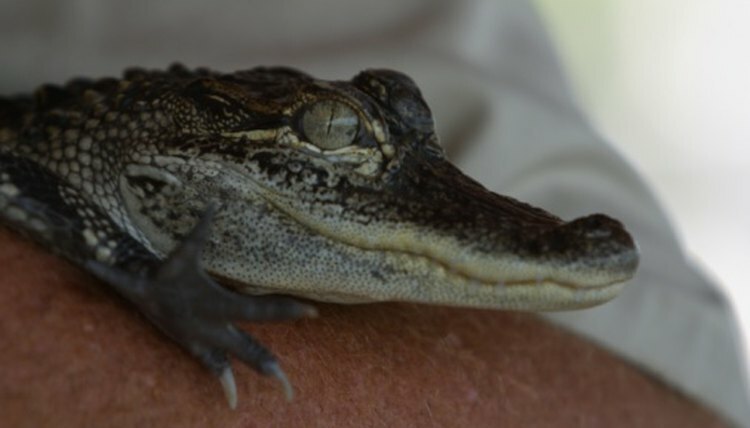 Your alligator enclosure must meet certain biological needs to maintain healthy alligators. Alligators need room to bask and they also need an area of open water area to swim, hunt and lounge in. You need a temperature control system including a water heater and possibly heat pads, plus both UVA and UVB lighting. As time passes, your alligator will need room to grow, so an enclosure that can be extended is ideal. Note that the average size for an adult alligator raised in captivity is between 4 and 7 feet, so he will eventually need an outdoor habitat. Plan ahead. Measure your alligator and measure the area you plan on using for the enclosure. According to Reptile Luv, your enclosure must include a dry basking space that is at least 1.5 times the length and width of your alligator. 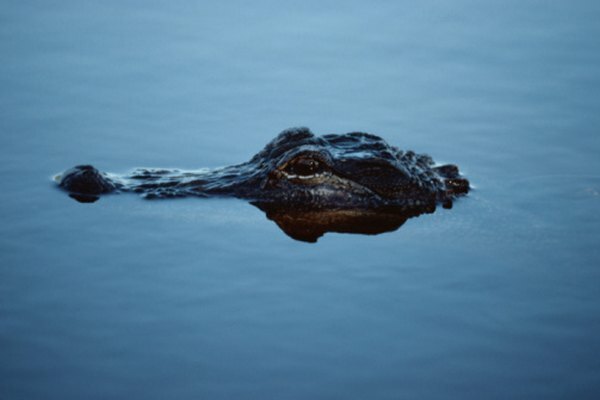 At minimum, the open water area should have a length that's at least three times the total length of the alligator; a width that's at least twice the alligator's length and a depth that's at least twice the alligator's length. You should also map out access to electricity, a water source and plan a location for water pumps and heaters that's easy for you to access safely once your alligator is fully grown. Consider the type of fencing you will want to best secure your alligator but also offer good viewing. Dig your water area. Dig the circumference of your fence line to a minimum of 2 feet deep. Alligators are expert diggers, so install permanent metal grid fencing around your enclosure below the ground surface, or better yet, pour concrete. Don't use wood, especially beneath the ground line where it can rot and become soft. Create your open water area by pouring concrete or by using a prefabricated pool or pond. One benefit of using prefabricated ponds is that you will know exactly how many gallons of water are contained in the swimming area, making it easy to measure out water additives for pH balance or dechlorination. Install a sturdy fence around the perimeter of the alligator enclosure. According to the University of Florida, alligators are good climbers, so an adult alligator will need a sturdy fence at least 4.5 feet high. Install electronics, including water filters, water heaters, thermometers and lighting accessories. Remember that electricity, water and large reptiles make for a dangerous combination. Put electronic devices in the driest areas and make them accessible outside the enclosure. Alligators require a specific amount of light. Use an automated timer for consistently correct lighting. Add water, fish, flora and decorations. Check your pH and add dechlorinator if needed in your area. Dropping a new alligator into a new enclosure with new fish and new water all at the same time will result in clouded stinky water, dead fish and an unhealthy gator. Plan on having your enclosure up and running for a good month before relocating your alligator. This way, the water cycle will be fully established, reducing the amount of toxic ammonia and nitrite buildup that will occur when your gator comes home. Alligators aren't ideal pets for most people. They're not recommended for beginner reptile or fish enthusiasts.